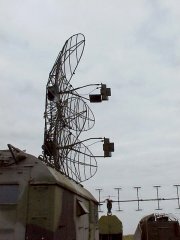 - a highly mobile radar unit, special designed for detecting of very low flying aircrafts (russian designator: 1RL12). The P-15 radar system can be deployed and put into operation within 10 minutes! Changing the directional diagram the both antennae are used in-phase or in opposition. As an option this radar unit got a special antenna on a pylon with a height up to 150 ft. The maximum height was reduced in turn with that but the antenna diagram bring more closer to the earth's surface for this and the radar unit could also locate extremely low-flying aircrafts This configuration got the NATO reporting name “Squad Eye”.